Collar Scale - Put simply, your shirt collar should be proportionate to your face. If you have a smaller head with finer features, go for a modestly sized collar (keeping the points long enough to touch your chest); a too-large collar will overwhelm your head and make it appear even smaller. On the other hand, a larger head with more expansive features will be unflatteringly magnified by a small collar; it longs for a beefier frame. 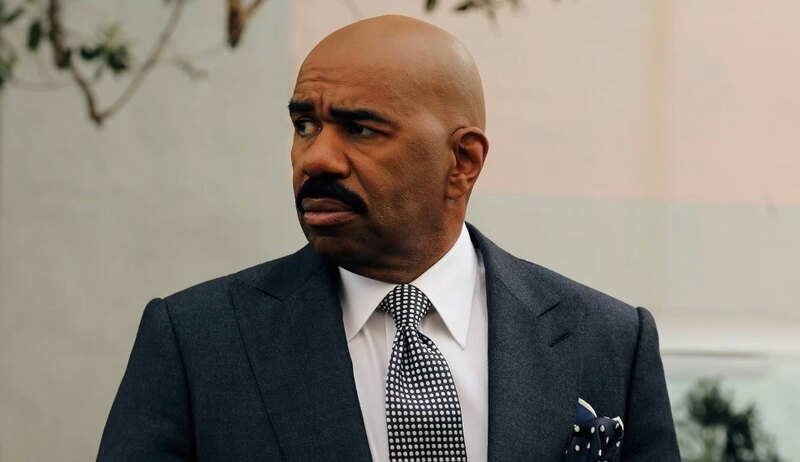 Steve Harvey shows us perfectly how to do this just right. Collar Band Height - The band is the separate piece of fabric and interlining that supports the collar. This is also about proportion, and a too-short collar band height is the most common and obvious trouble spot for men. It’s always a bit depressing to see a fellow who has clearly put some thought into his clothes, wearing a beautiful suit but with a sad diminutive collar and a run of the mill short front band that hangs gloomily low on his neck. Most guys have a normal to longer neck, and are best served by a collar with a taller front band (1 ¼” or more) that sits up properly beneath the chin. By the same token, a shorter neck’s appearance will be enhanced and lengthen by a shorter band. Collar Shape - Personal preference comes more into play here, but generally speaking, wider and rounder faces are best served by long (3”+) narrow-spread point collars that help to elongate their features. Longer and more angular faces are well counterbalanced by wider, spread collars. When your goal is to present yourself in the most flattering way possible, the difference in a standard shirt collar and one designed specifically to complement your features is quite marked, and it can be something of a revelation when you see yourself in a well-cut collar for the first time. While it’s possible to find a ready-to-wear shirt collar that suits you perfectly, for most of us these variables can only be achieved by having shirts made. In any case, none of this is an exact science, and it’s a good idea to experiment and find a look that you enjoy wearing. These are our humble guidelines, and can be brushed off by savvy folks who prize a particular collar’s effect. An aggressively spread “cutaway” collar, for example, is so extreme that it’s not particularly flattering on anyone, but it does have a sleekly formal look that can be rakish fun on occasions. At the other end of the spectrum are the long and narrow “spearpoint” collars favored in the 30s and 40s by men of all face shapes and sizes for their more casual, flyaway flair. We make both styles, and everything in between: to each their own. But whatever style you select, it’s good to know why you’re choosing it. In the gallery below, Jonathan wears spread collar shirts with tall front collar bands to complement his longer neck and narrow face. Alan and Andrew wear more pointed collar shapes, which pair well with their slightly more rounded facial features.